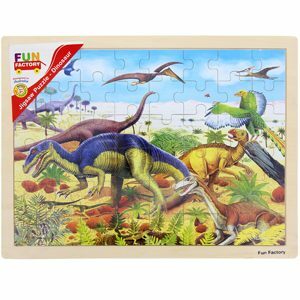 A great way to learn your ABCs with this Wooden Alphabet Dinosaur Puzzle. Your child then has the challenge of completing the puzzle by matching the lower case letters to the capital letters printed on the backboard. Educational and fun all rolled into one! Physical skills — from holding puzzle pieces and turning them until they fit. Cognitive skills — as they solve the problems of a puzzle. Emotional skills — they learn patience and are rewarded when they complete the puzzle. My daughter loves her “Dino head” puzzle. The raised edges makes it easy for her to pull apart and reassemble. Perfect for a preschooler who is dinosaur mad and very keen on learning his letters too! A two-in-one hit in our house! Great idea for learning the alphabet.